Jamie Vermiglio says there will be no pats on the back for him or his players if they finish second as missing out on the National League North title would be a failure. The Magpies have been battling at the top of the table from the start. And given the position they are in – and having sat top of the pile for the majority of the season – the Chorley boss would see it as a disappointment if they did not clinch the title. With six games to go Chorley are four points above second-placed Stockport County. Jim Gannon’s side used one of their games in hand to beat Ashton 2-1 in midweek and cut the seven-point gap Vermiglio’s side had created with a 3-0 win over Leamington. 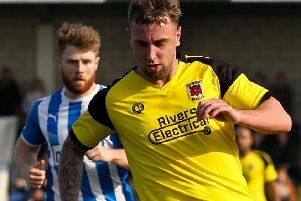 Now as they head to Chester on Saturday, the Chorley boss says he would class his first season as manager as a disappointment if they do not complete the job and reach the National League. Vermiglio said: “I made no secret of saying it from the very first moment I took over that my target was to win the league. I knew that was ambitious. There was a lot going against us and a lot of clubs that on paper have more of a right to win it than us. “But if you look at it we have been top for 80 per cent of the season so far. “So if we do not get promotion then it would be nothing but disappointment. There are no pats on the back for second place. “The play-offs are another option and we will reassess if that is what we have to do. Vermiglio made three additions to his squad on deadline day. Former Halifax left-back Raheem Hanley joined the club and Shaun Tuton joined on loan from promotion rivals Spennymoor Town. Midfielder Danny Greenfield, 18, joined on a work experience loan from League One side Barnsley until the end of the season. And Vermiglio was pleased to boost his attacking options. Vermiglio has been pleased with the response of the fans in recent weeks. The Magpies are unbeaten in five after a shock 1-0 defeat to Ashton United. After that Victory Park loss the Magpies chief and skipper Andy Teague asked for more positivity. And Vermiglio says the support of the fans really makes a difference as he called for more of the same in the final six. He said: “The fans have been exceptional. They were really strong on Saturday. “About a month ago after the Ashton game there was a bit of a message. “That was when we needed the fans most and we had a really flat performance that game. “We could have done with something else to help get us over the line and I did not feel like it really came. “Since then the supporters have been fantastic. “They are turning up in their numbers and they are singing loud, proud and all getting together. “The lads have commented on how much of a difference it makes.